Immerse yourself in the midst of history in this cosy slice of Scottish heaven. 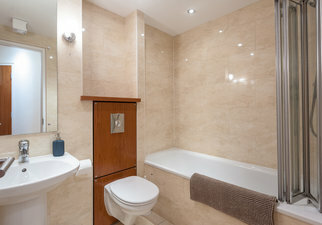 Located a stone's throw from Edinburgh's bustling, historical Royal Mile, this stunning 3 bedroom apartment is just waiting to be your home away from home. 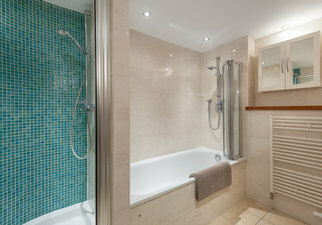 Your worries will be swept away by the fresh, soothing decor and charming decorative highlights. 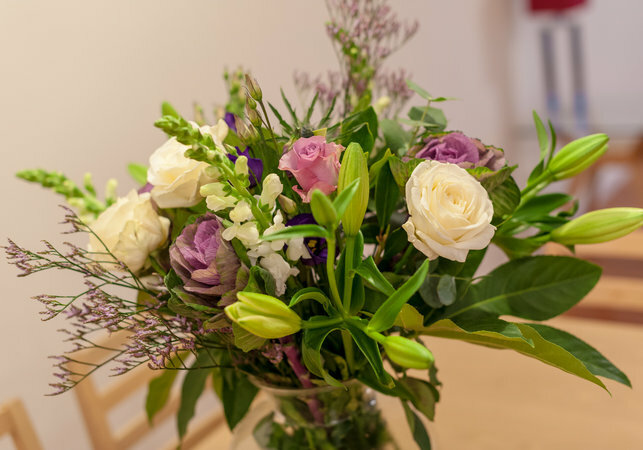 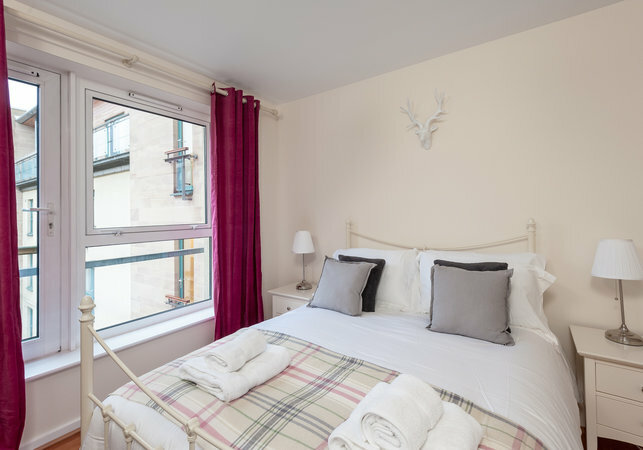 Located on the fifth floor with lift and on-site parking, the Holyrood Park Residence sleeps up to 5 guests in style, with every inch lovingly designed to ensure that your romantic getaway or family holiday will be one to remember. 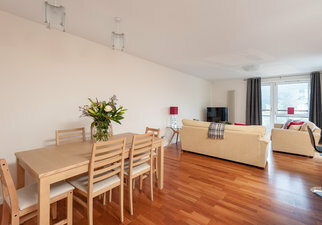 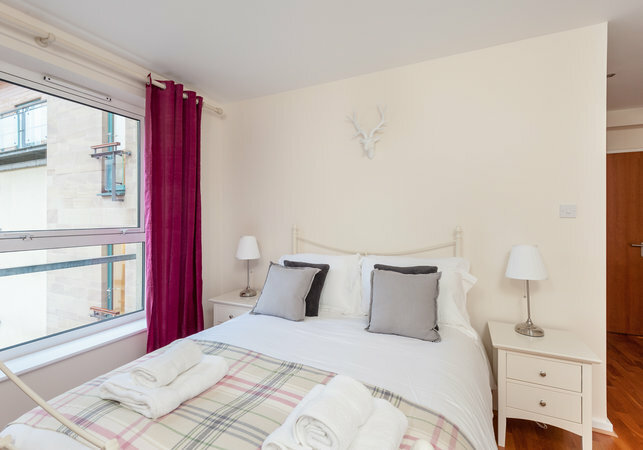 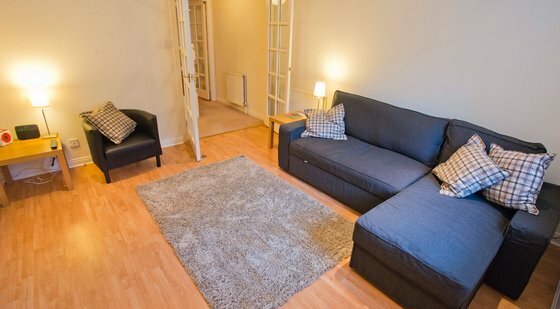 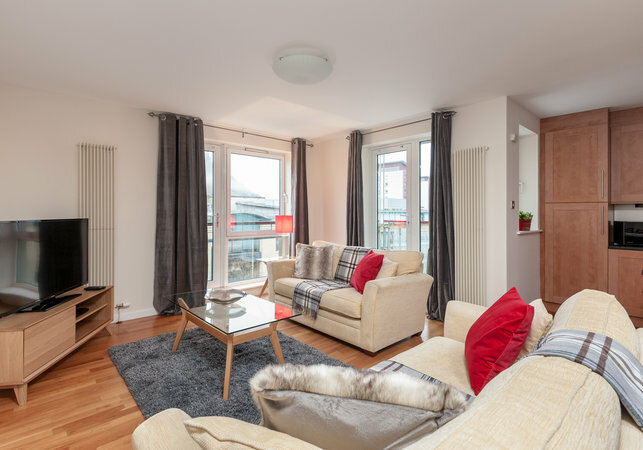 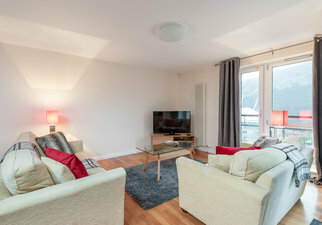 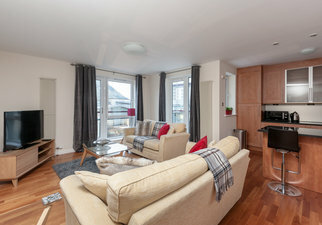 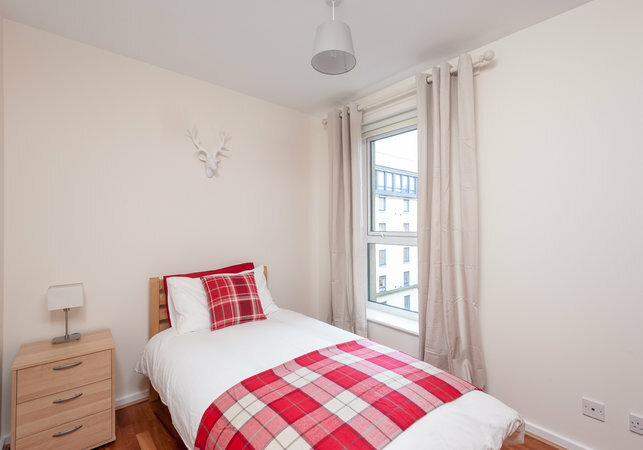 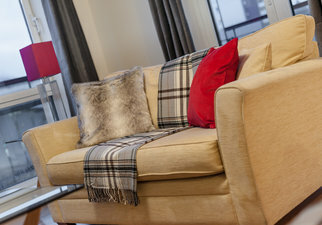 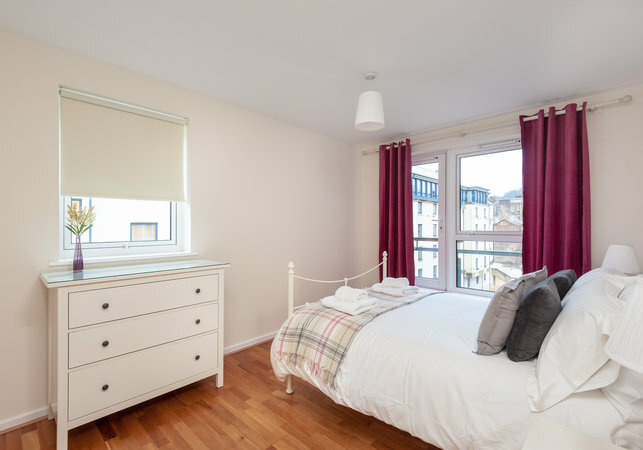 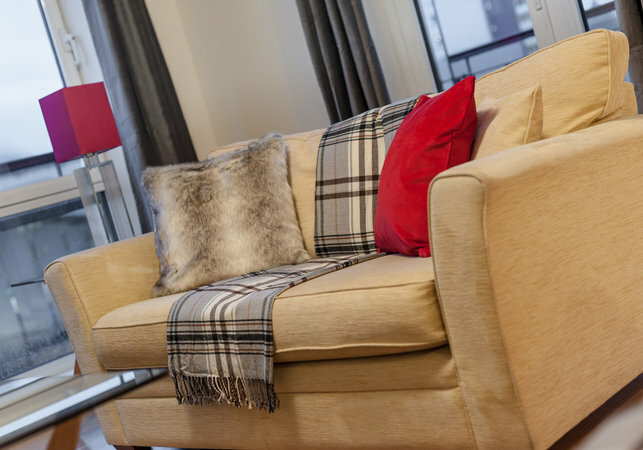 After a long day hitting the Edinburgh streets, relax in the bright and spacious living room, with delightfully comfortable couches and fluffy pillows. 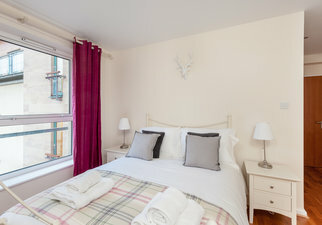 A firm advocate of good Scottish hospitality, this room simply begs you to have a tranquil afternoon snooze after a hard morning pounding the cobbled streets, seeking out treasures and bargains in one of Edinburgh's many charming boutiques. 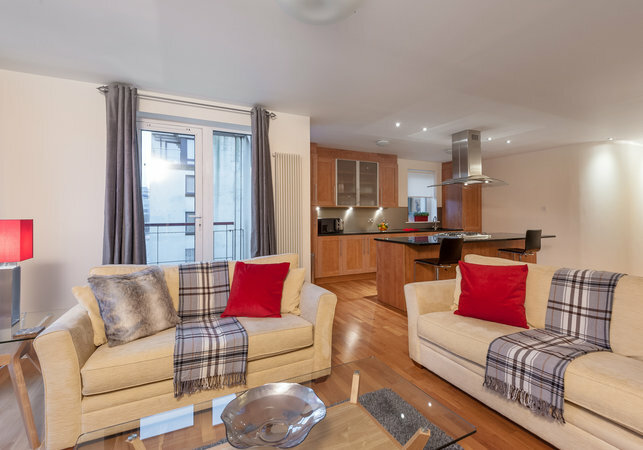 Enormous windows and a private balcony provide beautiful panoramic views of the city, best enjoyed at sunset with a chilled glass of wine. If you tire of watching the sun dip below the skyline, then the property features a large tv and an iPod docking station, perfect for late night movie marathons and early morning acoustics with a hot cup of coffee. 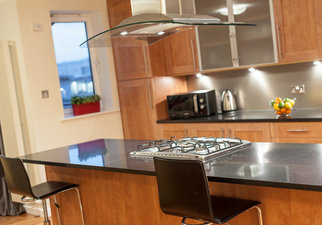 Located within the airy, open living space is a sleek, modern kitchen and dining area. 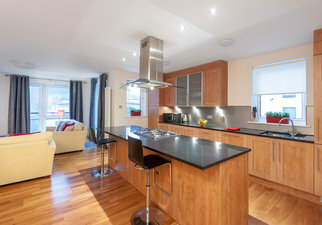 The dining table seats 6 guests easily, whether you'd prefer to serve scrumptious home-cooked feasts or plan your Edinburgh adventure over a lazy breakfast. 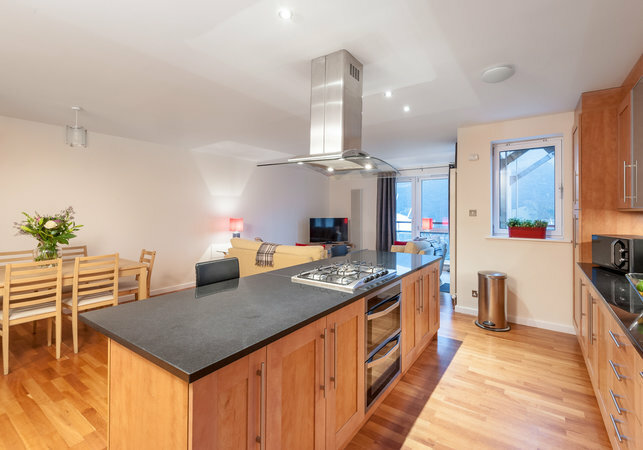 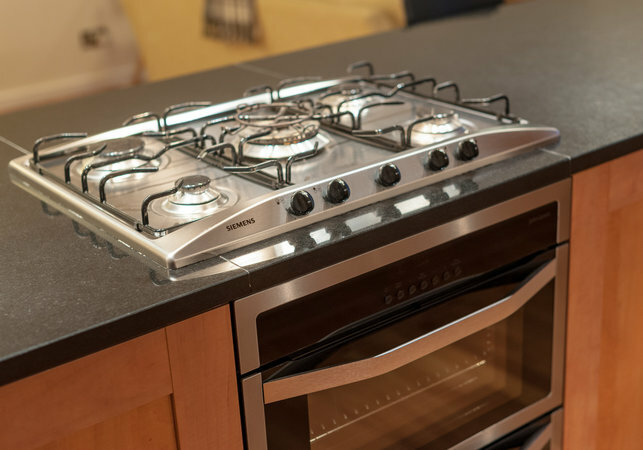 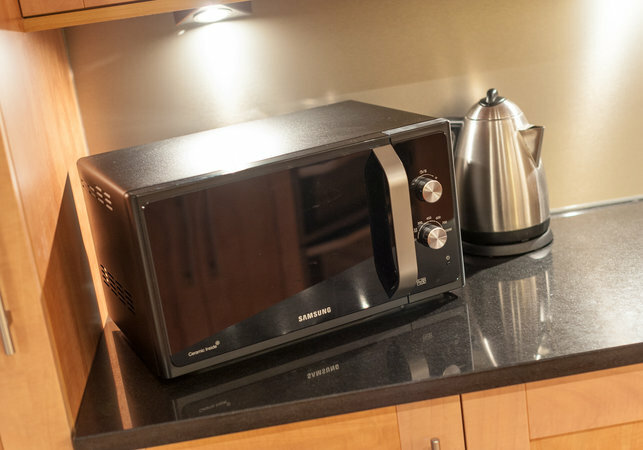 The kitchen is a chef's delight, with an impressive amount of cooking space and a breakfast bar, so that even those who are less gifted in the culinary arts can be part of the action. The kitchen is home to an impressive array of mod-cons, including fridge-freezer, microwave and a chic, modern counter-top stove. 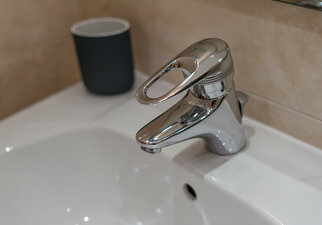 There's no need to even argue over who does the washing up; the Holyrood Park Residence's dishwasher has this covered for you. 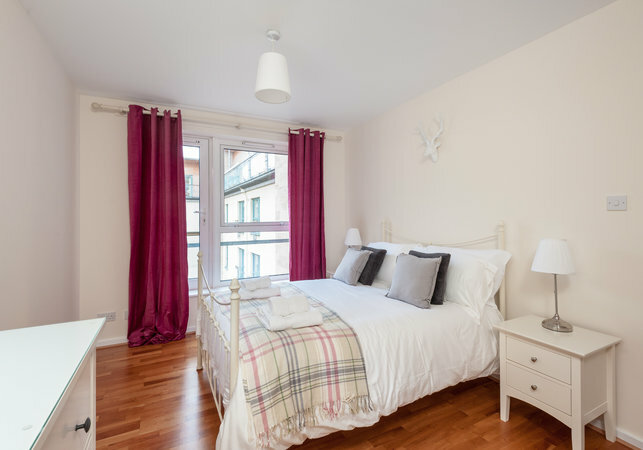 A good night's sleep is guaranteed in this property's three bedrooms. Light, bright and oh-so comfortable, featuring super snuggly beds with a delightful dash of tartan, our bedrooms promise that you'll wake up feeling ready to have an adventure. 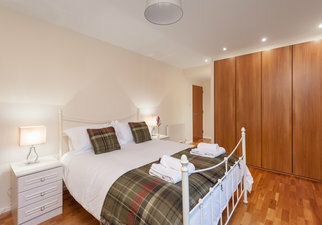 You can chose between two doubles, and one single bedroom, all providing plentiful guest storage with builtin wardrobes. 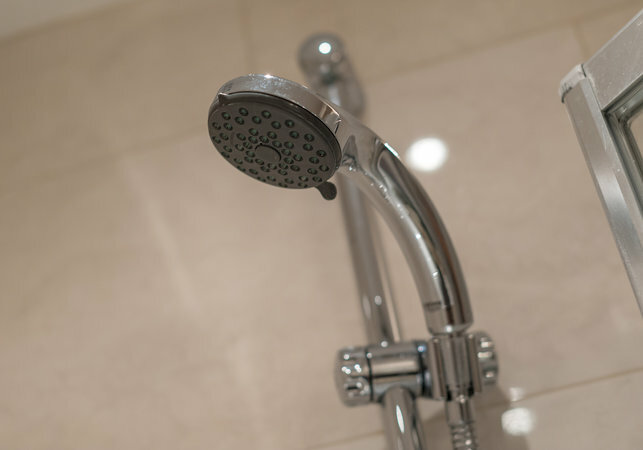 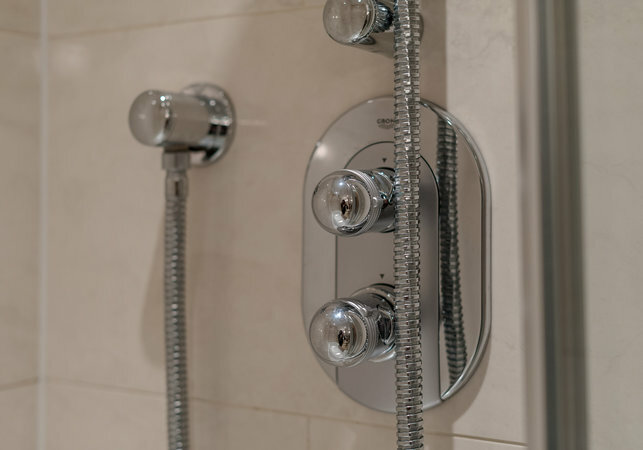 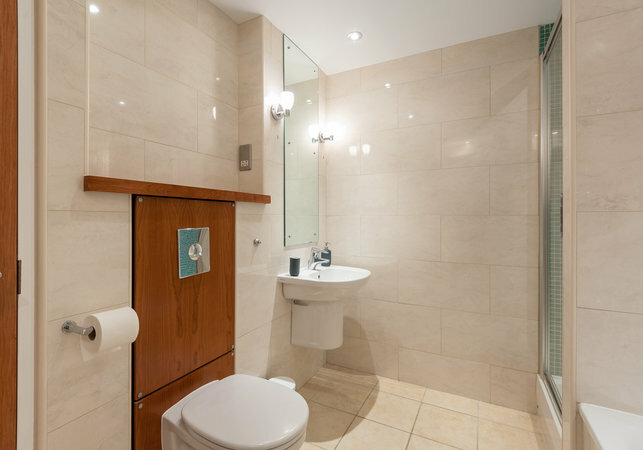 In the master bedroom you are treated to an en suite bathroom boasting a bath and separate shower, so you can luxuriate the evening away with a good book. 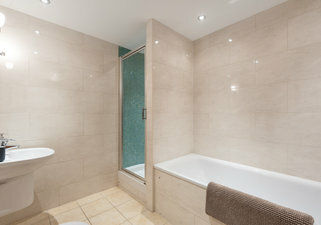 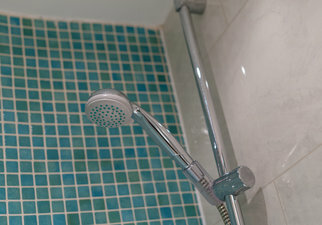 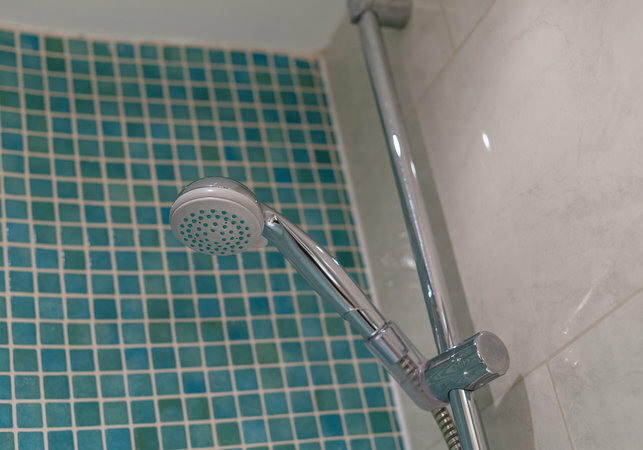 A family bathroom lies just across the hall with shower over bath, so there'll be no squabbles over who gets to have a lovely, hot soak first. 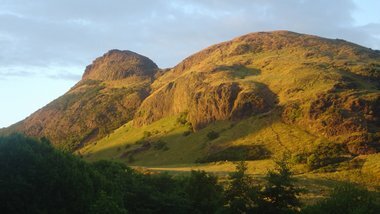 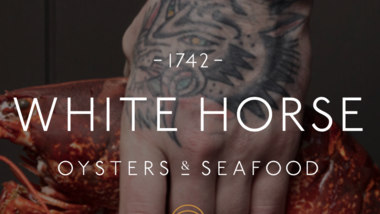 The local area is one of Edinburgh's most extraordinary, with history right around the corner at every turn. Visit Edinburgh's majestic castle or take in the view at the Scottish Parliament building. 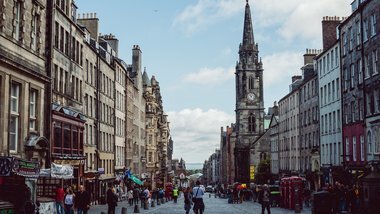 Take a spooky trip down to the Edinburgh Vaults or Mary King's Close, sample a warm-bodied single-malt whiskey or hunt for souvenirs in the bustling old town. 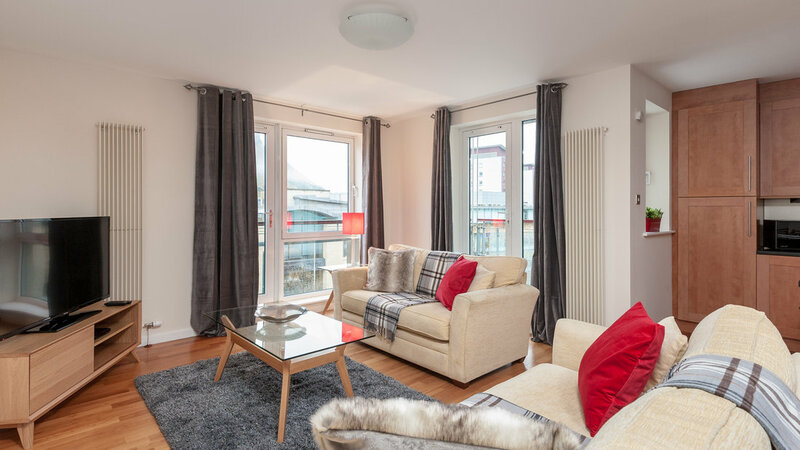 If you feel like going even further into the past, then Our Dynamic Earth and the National History Museum are both within easy walking distance. 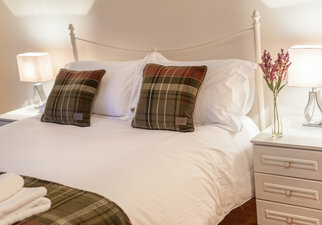 Feel like going further afield? 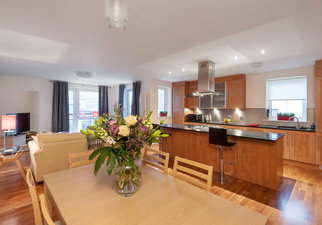 Then the local area plays host to an excellent bus service, and a simply fabulous hop-on/hop-off bus tour. 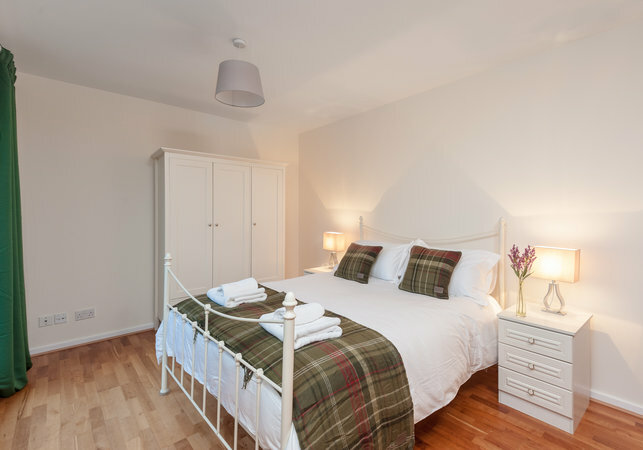 One queen size bed, one double bed and single bed. 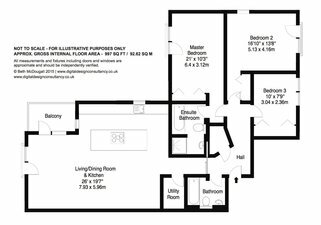 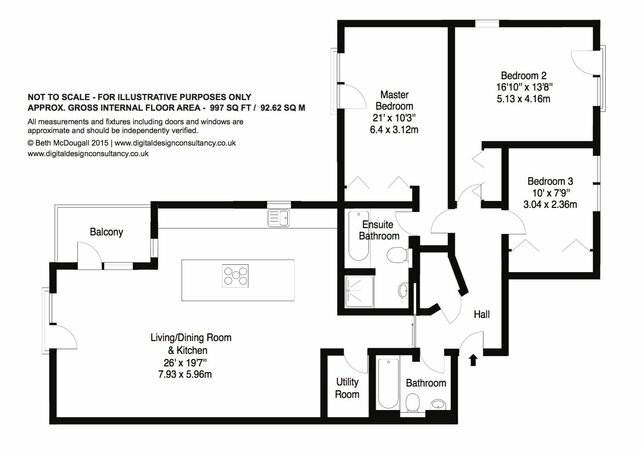 A central hallways leads to open plan living/dining/kitchen area with balcony and utility room, three bedrooms, one with en suite, and one family bathroom. This property benefits from secure underground parking.